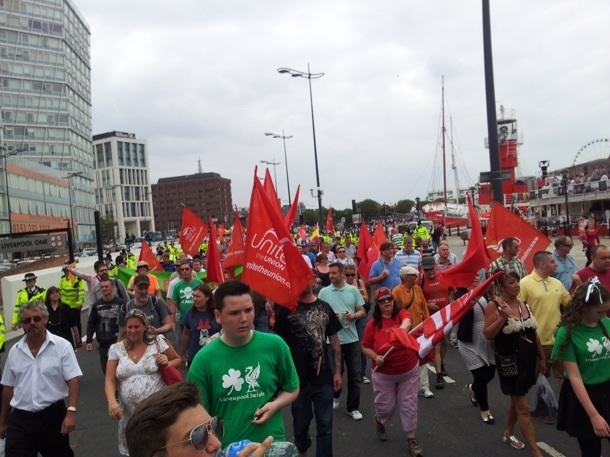 LIVERPOOL’S James Larkin Society march and rally on Saturday to remember the 100th anniversary of the 1913 Dublin Lockout passed off peacefully with up to 500 people taking part as plans by neo-Nazi hate groups and hardline unionists to attack the event in a repeat of last year fell apart. The Orange Order in Liverpool had appealed to its members not get involved in targeting the event and this was appreciated by organisers as a positive step, further isolating splinter groups from the English Defence League and National Front. Supported by Cairde na hÉireann Liverpool and many trade unionists and anti-fascists, organisers worked closely with Liverpool City Council and Merseyside Police to ensure its success. Ten opponents of the parade were charged by Merseyside Police with offences ranging from possession of cocaine, under the Public Order Act and a racially aggravated public order offence. The parade was led by the Liverpool Irish Patriots Flute Band and the rally was addressed by Communication Workers Union General Secretary Billy Hayes, President of the Communication Workers Union (Ireland) Cormac Ó Dálaigh, and James Larkin Society Secretary Steve Higginson.